A New Englander at heart, Maxine grew up near Boston, received a B.A. in Sociology from the University of Maine in Orono. She then spent a graduate year living at Perkins School for the Blind in Watertown, Massachusetts while taking classes through Boston University to become a teacher for blind and visually impaired children. In the mid 60’s, she came to New Jersey to become an Educational Counselor with the New Jersey State Commission for the Blind. At that time, New Jersey’s program for visually impaired children, most of whom were integrated into public schools with the help of an Ed Counselor, was a leading edge program in the country. She also spent some time working at The Library of Congress in Washington, D.C. in what was then the Division for the Blind, and spent a summer studying Education for the Visually Impaired at San Francisco State University. From her early years of graduate school, there was always one question that guided her studies, her teaching with children, and her professional direction … “What fragments us and what brings us back into wholeness or balance?” The search for answers to this question became a thread woven through her many years of experiences and career choices. In 1969, Maxine married Bob Guenther – they met skiing in Canada and both happened to be working in New Jersey. That’s how the New Englander stayed in the state of New Jersey. She stopped working at the NJ Commission for the Blind to raise their two daughters. Maxine returned to graduate school at Fairleigh Dickinson University in the early 80′s to obtain a Masters Degree in Human Development and Behavior. Still wanting to get closer to answering her guiding question, she decided that one of the missing pieces for many of us had to do with re-connecting with our bodies. This led to her to the study of bodywork and a different career. Looking for a practice that deeply connected mind and body, she discovered “Trager® Psychophysical Integration” created by Dr. Milton Trager. The practice is also described as “movement re-education.” Maxine began studying the Trager Approach in 1984 and had the privilege of studying with Dr. Trager many times before his death in 1997. Maxine established and enjoyed a private practice as a Trager Practitioner for 25 years. She taught many Introductory Workshops and also became a Tutor for the U.S. Trager Association, working in that capacity with Trager students and Practitioners until she retired her Trager practice in 2009. Underlying all of her studies was an active interest in holistic health and Chinese medicine. Beginning in the ear ly 1980’s, Maxine spent many weeks and weekends taking classes at Omega Institute for Holistic Studies in Rhinebeck, New York. In 2002, she signed up for two workshops in Qigong with Roger Jahnke, O.M.D. and fell in love with Qigong! 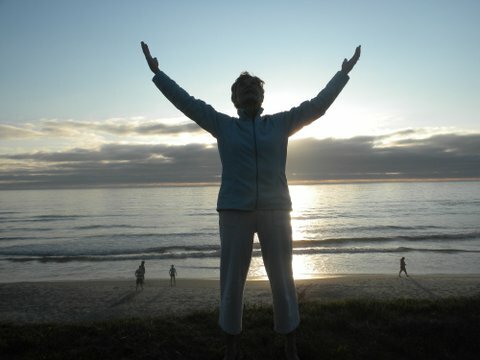 With her many years of practice and teaching in Trager and movement re-education, Qigong felt like a coming home! The following fall of 2003, Maxine spent a month at Omega in a 200 hour teacher training with Dr. Roger Jahnke and has been teaching ever since. Since then, she has studied many times with Dr Jahnke and with other fine Qigong and Tai Chi teachers. She is a professional member of the National Qigong Association, enjoys attending their annual Qigong conferences and has presented workshops at NQA twice. She also is a professional member of the Institute of Integral Qigong and Tai Chi (IIQTC). 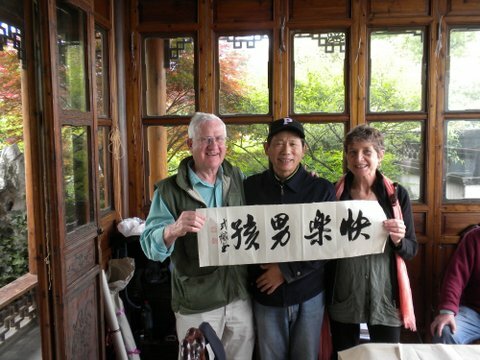 In 2010, she and her husband took an amazing trip to China with Solala Towler, spending 5 days in the sacred Wudang Mountains practicing Qigong. Maxine’s great passion is practicing and teaching “Qigong for Good Health.” Occasionally, she teaches workshops at Brookdale Community College; she has especially enjoyed teaching “Everyday Qigong” at the annual Women’s Conference. With every class and with her students, Maxine deepens her own understanding and learning of Qigong. Her other passions include dancing with “The Core of Fire,” an interfaith dance ministry, and hiking almost every morning with Bob and their current 4 legged friend, Black “Berry” – all happy with feet and paws on the earth! These are some activities that can bring me back into wholeness and balance. B Berry, our Lab mix, often lays close by when I practice Qigong … plenty of good Qi for all!